Google Cloud Print is a service by Google, Inc. that allows business users to print to their KYOCERA printers from a smartphone, tablet, PC, and any other web-connected device. This gives unmatched flexibility and enhances a business users’ ability to work on-the-go. The service allows you to print anything, from any device, to any cloud-connected printer, without installing a specific printer driver on your device. 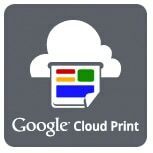 Using Google Cloud Print, you can make any compatible Kyocera printer available to you from applications used daily. Whether you are outside the office, or overseas on a business trip, you can send your print jobs to registered Kyocera Google Cloud Print Ready printers.